On Thursday morning, the Keystone Pipeline spilled about 5,000 barrels, or 210,000 gallons, of crude oil in Amherst, South Dakota. 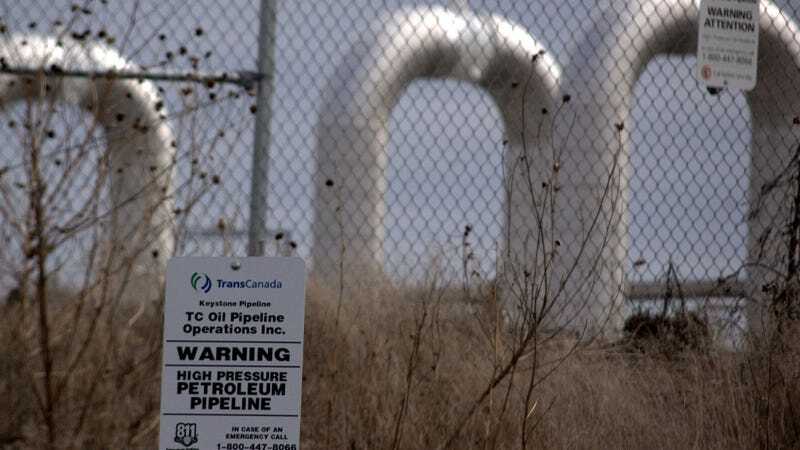 The pipeline has been shut down as operator TransCanada investigates the incident. So far, the company hasn’t reported oil entering any waterways or water systems, but Brian Walsh with the Department of Environment and Natural Resources told KSFY News that cleanup will “take some time.” He also told CNN this is the pipeline’s largest oil spill in the state so far. The 2,687-mile-long pipeline isn’t the same one, however, as the Keystone XL. This one’s been around since 2010. Keystone XL doesn’t even exist yet. You see, the Keystone XL is a proposed extension of this already existing Canada-to-U.S. pipeline system. Keystone XL would be shorter, stretching 1,179-miles long and shipping an additional 830,000 barrels a day. Sisseton-Wahpeton Oyate Tribe Chairman David Flute told BuzzFeed News the leak was on a section of pipeline adjacent to the reservation. Flute is concerned about contamination given the pristine waterways that exist in the state. “If they’re unable to contain it from seeping into the water systems, it can be hurtful and harmful to everybody,” he said. But, again, for those in the back: This is not Keystone XL. Keystone XL is the one that’s made a whole lot of noise the last few years. That’s the one President Donald Trump has attempted to push through. That’s the one indigenous-led environmentalists have been trying to stop from happening. That doesn’t mean the Keystone Pipeline doesn’t matter. In fact, this spill is exactly what Keystone XL opponents worry about. The Nebraska Public Service Commission will decide Monday whether it should approve a permit the Keystone XL needs to begin construction. This is the last leg left in TransCanada’s approval process and it’s possible this spill might shape whatever the commission decides. Regardless, TransCanada owns both pipelines, so if this spill is indicative of what to expect with its proposed project, that’s not too good. * Correction: This post has been updated to clarify that the drop in pressure was a result of the pipeline leak, not the other way around. Thank you, faithful, brilliant readers, for catching this erroneous mistake.